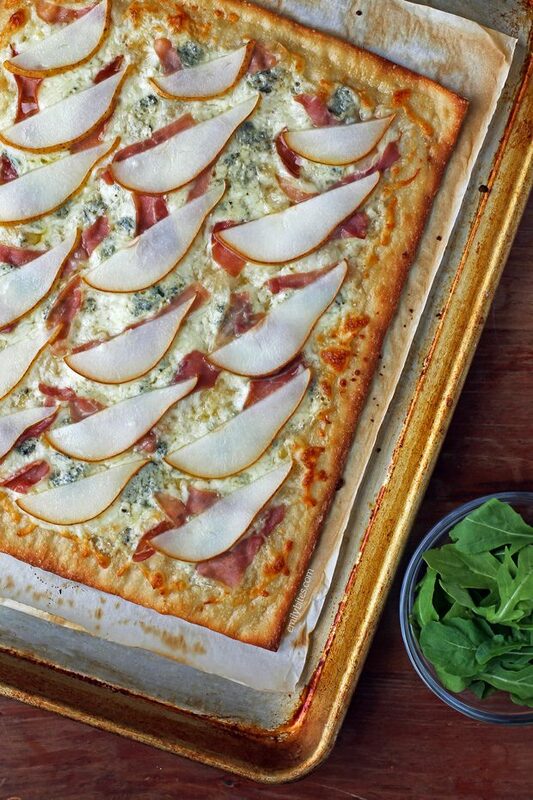 This Pear Prosciutto Pizza post is a sponsored conversation written by me on behalf of Pillsbury. The opinions and text are all mine. Comments submitted may be displayed on other websites owned by the sponsoring brand. You’ll never believe how easy it is to make this Pear Prosciutto Pizza at home, because it tastes like a decadent dish you’d order at a classy bistro. 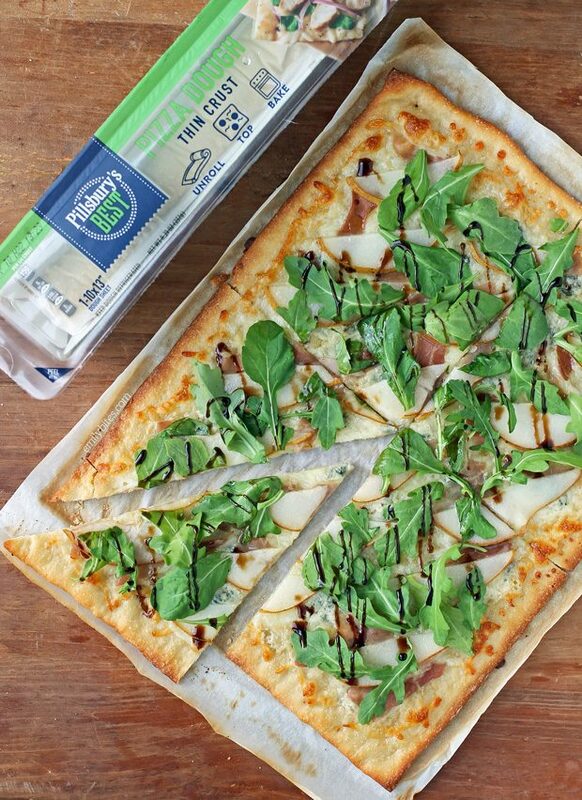 The sweet pears, tangy balsamic glaze, rich blue cheese, melty Mozzarella, salty prosciutto and peppery arugula blend together beautifully atop a flavorful, thin and crispy crust. I’m telling you, it’s pizza perfection. Plus, a quarter of the pizza (two slices) is just 302 calories or 9 Weight Watchers SmartPoints! Now that’s how you elevate your pizza night. 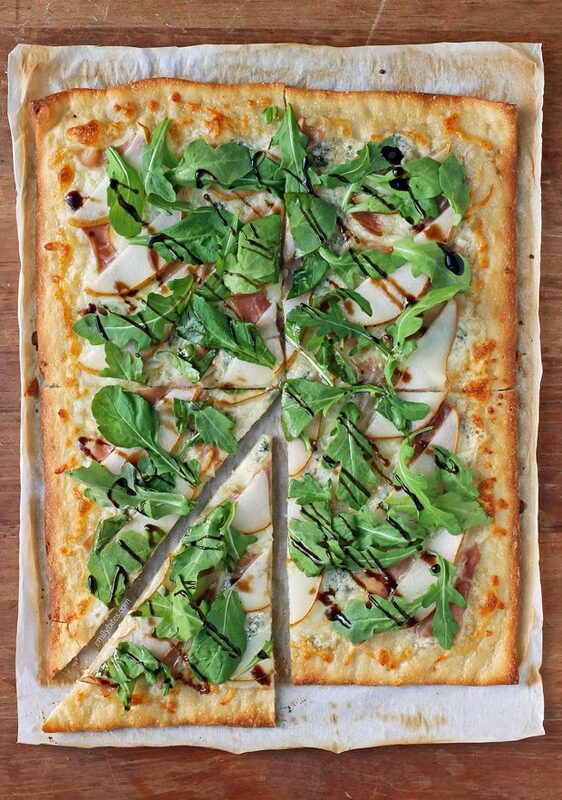 Not only is this Pear Prosciutto Pizza full of flavor, it comes together super quickly making it perfect for a weeknight meal or a tasty snack for a girls’ night in. When Pillsbury asked me to try their new Pillsbury’s Best Pizza Dough I was beyond excited. I love Pillsbury products and this new dough is made with clean ingredients and can be found right in the refrigerated dough section of your grocery store. I found the Pillsbury’s Best Pizza Dough to be especially convenient because it comes already rolled up on a sheet of parchment paper for you to bake it on – all you have to do is unroll, top and bake! This new dough comes in a classic crust variety as well, but I used the thin crust because that’s what makes my pizza dreams come true. Once you’ve unrolled your dough and parchment paper onto a baking sheet, I recommend brushing your pizza dough with a little olive oil and pre-baking it a bit to enhance the flavor, color and crispiness of the crust. Once that’s done you just add your cheeses, prosciutto and pear slices and place it back in the oven to heat the toppings, melt the cheese and finishing browning the crust. Finish it off with the arugula and a drizzle of balsamic glaze before slicing and serving. We’d love to see you make this pizza (or one of your own) using the new Pillsbury’s Best Pizza Dough, so be sure to tag us on Instagram or Twitter at @emilybitesblog and @pillsbury or use our hashtags #emilybites and #pillsbury. I love seeing your pictures when you make my recipes! Place the oven rack in the bottom third of your oven and heat the oven to 425 degrees. 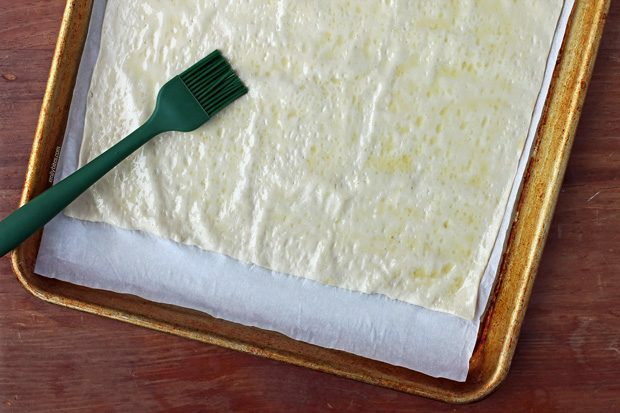 Unroll the pizza dough on its parchment paper onto an ungreased baking sheet. Use a pastry crush to brush the surface of the dough with the olive oil. Place in the oven and bake for 7 minutes. Remove the sheet pan from the oven and sprinkle the shredded Mozzarella cheese across the surface, leaving a rim around the edges for the crust. Sprinkle the blue cheese crumbles evenly over top the Mozzarella and follow with the strips of prosciutto. Add the sliced pears in a single layer and return the pizza to the oven for another 7-11 minutes until the cheeses are melted and the crust edges are golden brown. 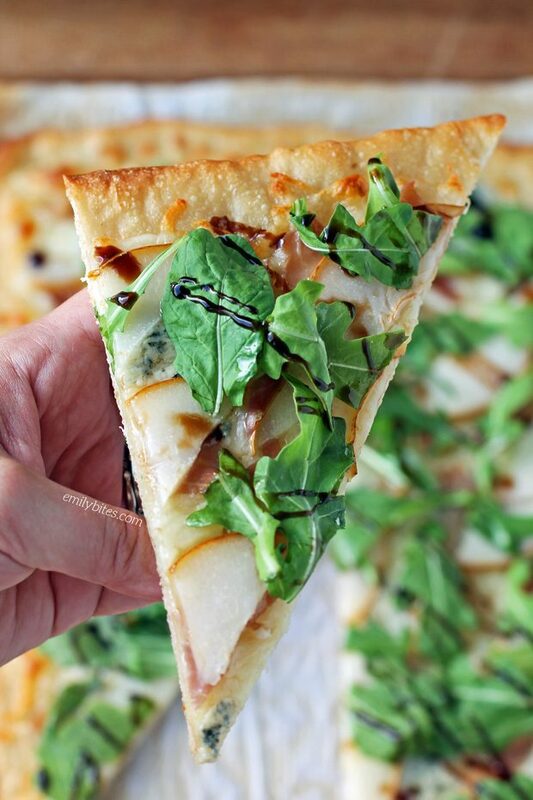 Sprinkle the arugula leaves over the surface of the pizza and then drizzle with the balsamic glaze. Transfer the pizza to a cutting board and slice into 8 slices. Serve immediately. I love specialty and gourmet pizzas and was very excited to make this for lunch today. It was delicious! And so easy to make too. My store did not have the new Pillsbury pizza dough so I bought the Pillsbury thin pizza dough in the classic container and it worked just fine. Thanks for a great recipe! I’m so happy you loved it, Cyndi! Pear pizza? Sounds really interesting! Different for sure, I’m curious to give it a try! DANGER: This is soooooo good. My husband and I couldn’t stop until we ate the whole thing. Plan your week around it!